Visiting the Kodokan Judo Institute is something I would recommend for any judo enthusiast. We all know how widespread judo is in Japan, but to be at the birthplace of the sport will bring new value to the art we all have grown to love. I appreciate more the operational and organizational requirements involved in overseeing an art as globally popular as judo. When you see the eight story building that is the Kodokan, most of the space is used not for training, but for managing the sport. One of the great benefits of teaching abroad is the ability to travel more. Not only is there more free time, but you are also closer to countries that you would otherwise never get a chance to visit unless for a unique circumstance. Japan is always a common destination for travelers. I’ve been to Tokyo, but there are so many other cities to see. During one of my vacations I took a trip to Osaka. A common travel plan is to visit Kyoto while in Osaka because you’re just a short 20-45 minute train ride away depending on the type of train you choose. I realized within the first day or two, however, that seeing what I wanted to see in Osaka would not allow me the time to get away to see Kyoto as well. I visited for 5 days. I decided to make this compilation video of my time in Osaka. There are some popular destinations in it, but also some that the general public would not think of to visit. I hope you enjoy the ride. Brazilian Jiu-Jitsu is arguably the hottest martial art right now, with it’s growth outpacing all others. This is for good reason; it’s popular in the Ultimate Fighting Championships, is a highly effective self-defense system, and dynamic sport. As expected, Korea has taken to the sport and it continues it’s upward trend of growth to this day. Here in Busan it’s no exception. With the likes of Kim Dong-Hyun leading the MMA charge in the UFC, the sport is exploding. I’ve trained in BJJ at American Top Team, Gracie Barra, and of course Busan Team MAD! As with judo (and any martial art for that matter) the camaraderie is awesome and I’ve made new, life-long friends in BJJ. I decided paying homage to the sport here in Korea was only fitting since it’s right here at my fingertips. I hope you enjoy this montage. It’s just the tip of the iceberg. The post Brazilian Jiu-Jitsu in Korea: Art of the Morning Calm appeared first on The Red Dragon Diaries. Wow! It’s been nearly a year since I first posted judo video tutorials by my 7th dan instructor. I don’t know why I haven’t done more. I literally walked into one of the coolest situations a judoka could ask for. Just steps from my first apartment was a small, but historical Korean judo school. Amazingly, the judo school was founded before Korea even established it’s independence. About a year before Korea became an independent nation, Kook Sa Kwan Yudo Jang was founded in Japan. Pretty cool, isn’t it. If you would’ve told 18 year old me that I would one day be a martial arts black belt, I would’ve exhaled the smoke from my hippie chic clove cigarette and laughed in your face. At 27, I would have told you sadly that they don’t give black belts to fat girls. By 30, I might have been interested but still a little incredulous. By that time, I had shed fifty pounds and was starting to learn that almost anything is possible. Last week, at 33 and some change, I did something I never actually thought I would do, even when I started taking classes two years ago. I became a certified, card-carrying (for real, there’s a card, like a license to kill or something) 1st degree black belt in hapkido, an accomplishment I share with at least a third of Korean ten year olds. But, still, it’s a big deal to me. 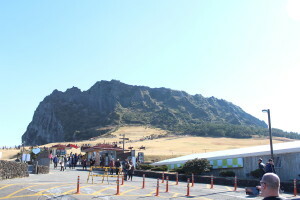 Jeju is one of South Korea’s prized possessions. The volcanic island is home to many UNESCO heritage sites and is aptly called the “Hawaii of Korea”. Being less than an hour flight from Gimhae International Airport in Busan, I knew I would eventually visit the island. When I found out that the final leg of the IJF Grand Prix series was being held in Jeju, I knew it was something I couldn’t possibly pass up. Luckily, exams at my elementary school were happening at the same time as the tournament and I was able to reallocate some paid leave days. Where can I buy a Jo staff in Busan? Anyone know where I can buy a short jo staff in Busan? As I am sitting here writing this blog, my arm is slowly returning to a normal color. Fleeting are the days of tie-dye skin tone and a swollen Popeye-sized forearm. What am I rambling about? Yet another judo-related injury here in Korea. For the life of me I can’t understand what I did to deserve the injuries and near death experiences I’ve enjoyed while practicing judo in Korea. I’m not talking the normal twisted fingers and toes, or sore shoulders, or anything like that. I’m talking REAL injuries.